Today is President's Day! You must stop over to One By One The Flamingo's Are Stealing My Sanity!! Karel has lots of fun things going on this month. I have been thinking of things to do with Robbie during his vacation from school. We came up with this song. Now mind you he veered off from the song a bit and decided that chasing Mama with a bee is more fun! He chases me singing "Sting, sting, sting goes the bee that chases Mama! Buzz, buzz here I come!" 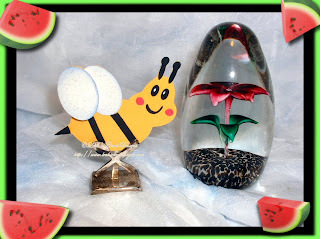 The bee I designed in Cricut Design Studio using George & Basic Shapes, All Mixed Up and Create A Critter. Thanks for stopping by for some of our silly fun. Now be sure to hop over to Karel at One By One The Flamingo's Are Stealing My Sanity!! Click the button below and you'll be off. Have a great day now!! !